Shirley Peters, taken on film, 2018. Copyright © Sophie Polyviou. From toddlerhood onwards, Shirley was raised by her ‘beautiful’ grandmother in Dominica while her parents worked abroad. She talks about the values her grandmother gave her and the decisions she made about childcare when she had her own children in the UK. Shirley: I can remember when I was in India, in Old Delhi, and the children of the poor [were] around the rubbish tips, and they’d be picking up things from the rubbish tips and so on. I used to create in my mind an oasis, where there’d be water and greenery all around with lots of toys, and just to let them play and be happy. My name is Shirley Peters. I live in Manor Park, East London. I was born in Antigua but I was taken to Dominica by my mother’s mother, my maternal grandmother from the age of one year and eleven months. So I grew up mostly in Dominica in the West Indies. Then I came over here to London to do nursing in 1970. I am now retired and I look after my three grandchildren because my daughter works full time. Rosa: I’m Rosa Schling, I’m a new parent, and I’ve been recording memories of childcare and parenting in London’s East End. This is Holding the Baby, an On the Record podcast. Yeah, I chose the nursery setting over the childminding situation because of stories that I’d heard from my other family and friends who had come here before me. The childminders were not registered and they were criticised for keeping the children in the same dirty nappies. I wanted the nursery situation where there were more eyes [laughs]. Did you find there were quite a lot of worries among other people you knew that had come from the Caribbean about childcare? Was that quite a big issue? That was a big issue, because they didn’t have a lot of money. Do you think there was more pressure or necessity for both parents to work as well? Oh yeah, both parents had to, indeed. Not all parents worked, some husbands insisted that the mothers stay at home and they’ll make do, but in most cases most of the women, if they found work they’d go to work. Your mother travelled to quite a few different places for work and meanwhile were you being looked after by her mother? Mostly by her mother. It was lovely, they were, all grandparents were beautiful. What would you say your grandmother’s attitude to childrearing was? She was very strict. She was very sweet, very nice, but there were certain things I could do and and certain things I couldn’t do. Children had to listen to their parents, not to argue with their parents, or grandparents. Yes, and I grew up that way, wanting to be a good girl, you know! [laughs] We would be given a beating if we behaved badly when we were growing up. We feared the beating of course. I feared most the telling off, you know, because it made me feel really ashamed, and this is why, I better be a good girl so I don’t get told off, than the beating. So I was her little girl, she used to call me her little Canute, which is a boat, her little handbag and her butterfly. How often would you see your mother and father? I didn’t see my mother, after I went to Dominica at the age of a year and eleven months, I didn’t see my mother until I was ten-years-old. Yeah. I used to fantasize being with my mum and dad, and my brothers and my sisters, I used to be so happy in that sort of dream. Not because I was neglected but just in my head, you know, you go into that fantasy. 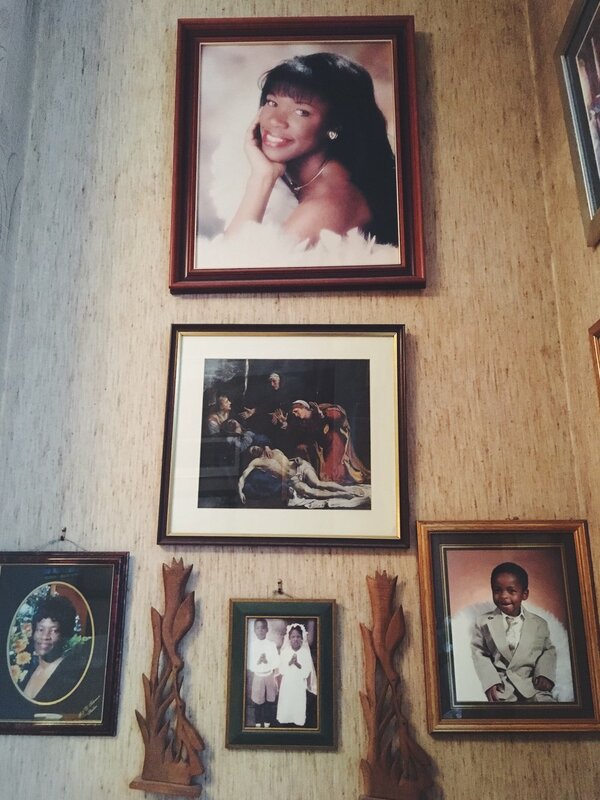 Photographs of Shirley Peter's home, taken digitally, 2018. Copyright © Sophie Polyviou.